Direct from Sundance 2015, The Stanford Prison Experiment makes its way to the Edinburgh Film Festival and gives us a harrowing look at dark capabilities lurking in the human psyche - especially in relation to authority and control. Based on the 1971 works of Dr. Zimbardo (Billy Crudup), The Stanford Prison Experiment details the results of a variety of students being randomly appointed guards and prisoners and placed in a makeshift prison environment (based in university offices). This was intended as a study into the effects of imprisonment, with the outcome still shocking to this day. Director Kyle Patrick Alvarez's account of Zimbardo's study is a gruelling examination into the darkness man is capable of - especially when granted with a form of dominant power. The opening moments present the selection process, showing that these twenty four men appear relatively ordinary, all unremarkably equal - however, when split into their respective roles of prisoners and guards, Alvarez's film begins to truly shock. Based on a screenplay from Tim Talbott, The Stanford Prison Experiment quickly showcases how student behaviour changes exponentially when subjected to this structure and pack mentality. Alvarez refuses to hold back in his presentation of the harrowing mental and emotional breakdown of prisoners which makes for a thought provoking and undeniably tough watch. In his claustrophobic and clinical direction and alongside the stark cinematography of Jas Shelton, Alvarez makes the university office space feel like a county prison. Therefore the rate of prisoner break-down is remarkable as these young men adapt to this dynamic, despite the quickly-increasing cruelty imposed by their pack of guards. Talbott packs so much content into each cinematic day (surely thanks to the food for thought provided in Zimbardo's fascinating original examinations) that it feels like we have been watching week's worth of events, not hours, with prisoner emotional responses similarly channelling this. 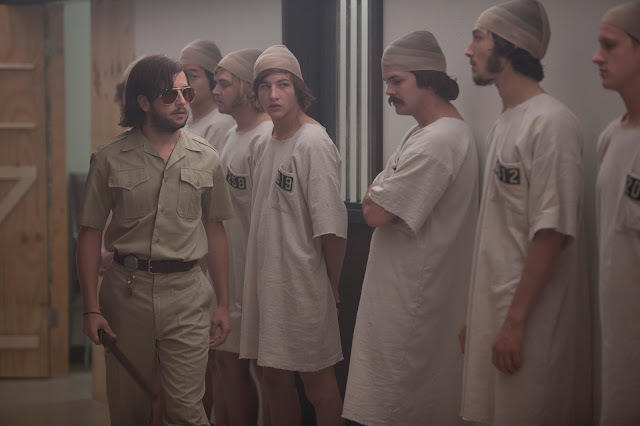 The Stanford Prison Experiment devotes time to shaky morality tale lurking within a study like this and raises issues about the importance of subject wellbeing within the world of research (Zimbardo's experiment was called off after six of fourteen days). Whilst capturing the heated dynamic within the 'jail', Alvarez does a stellar job at making sure the scenes in Zimbardo and his colleagues' control room are just as heated. There are inspired performances that capture both sides of the power dynamic: from Michael Angarano's cruelly over-zealous Correctional Officer dubbed 'John Wayne' by the "inmates" to Ezra Miller's free-spirited prisoner who is subsequently broken-down, whilst Billy Crudup excels at capturing the murky ethics behind the experiment. Like similarly themed projects Compliance and Experimenter, The Stanford Prison Experiment presents human dominance at its worst - and whilst it doesn't provide alternative options on the subject of punishment/rehabilitation, Alvarez provides plenty to think about here.